This 30 inch wide dresser unit not only provides tons of storage with 4 large, deep drawers, it is the perfect height for a countertop in your closet. This unit is meant to be installed beside another similar closet unit or wall. 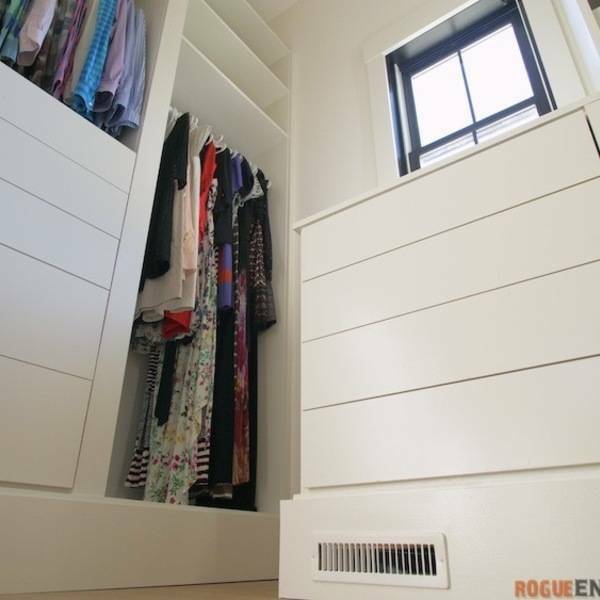 If installing an upper hanging unit above this unit you will need to extend the sides to accommodate. 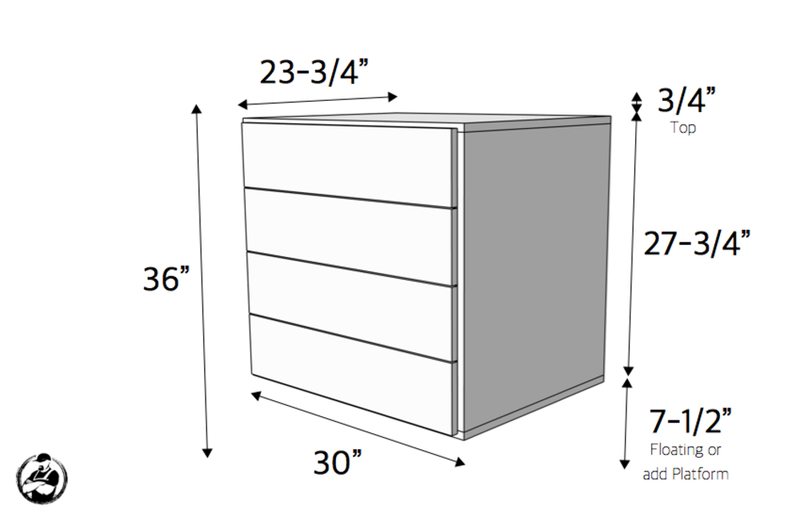 Here are the dimensions for this closet section. This section is designed to sit on a platform or on the ground. I recommend building a platform that is 1/4" to 1/2" shorter than your baseboard trim, then lay MDF on top of the platform. 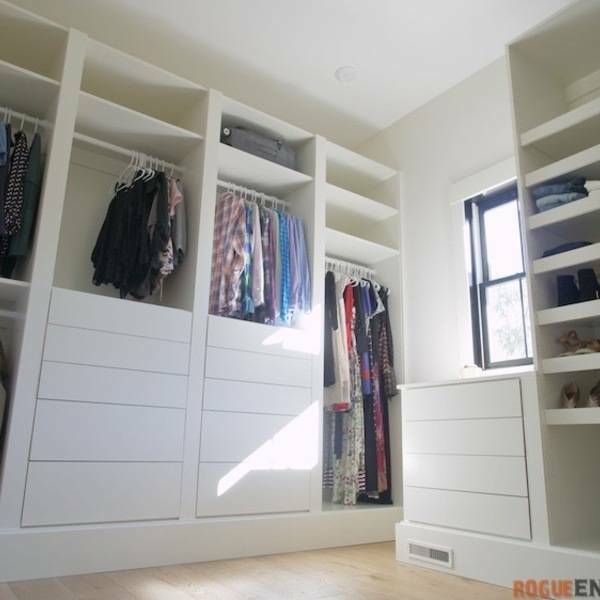 The baseboard trim will then continue across the front of the closet unit for a built in look and the only thing exposed will be the MDF top which paints very nicely. 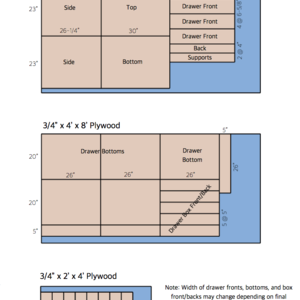 For the first sheet in the cut list, you can use MDF or plywood for this. I used MDF because it takes paint a lot nicer and is cheaper than plywood. However, MDF is finicky to work with. It is heavy, doesn't accept a screw very well and isn't structurally a very good material to work with. Since this unit is going to be secured to the wall and adjacent units I wasn't too worried about that. 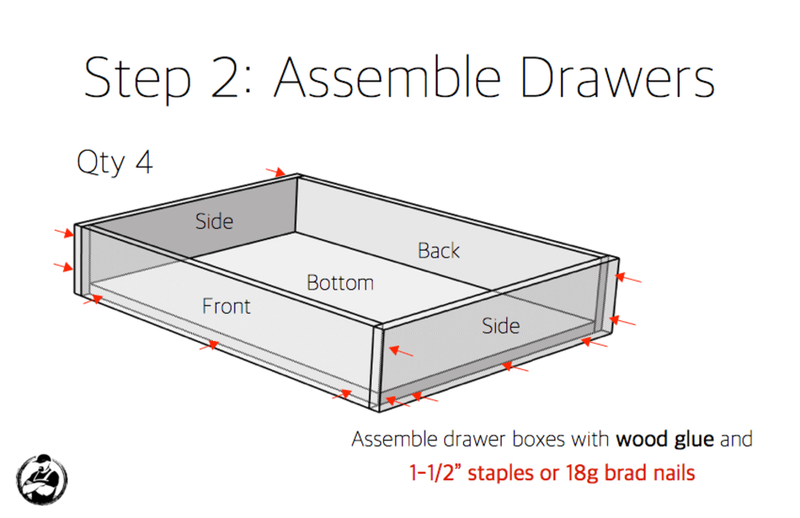 Note: The drawer fronts in this cut list are made to the same width as the inside opening of the carcass. That way, when the carcass is set and trim is installed over the side edge and the adjacent carcass, the drawer front will be flush with the trim. 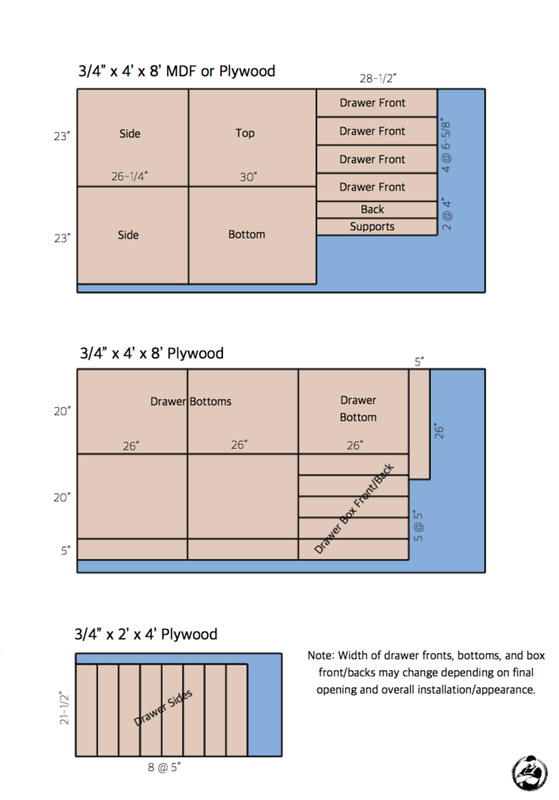 This last 2 sheets in the cut list are for the drawer boxes. These need to be cut from plywood for the added strength. 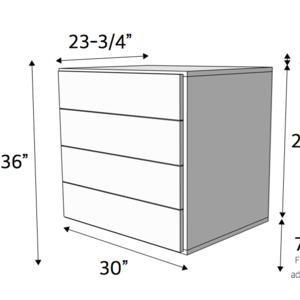 The dimensions in this cut list accommodate 1/2" thick, side mount, drawer slides in a 28-1/2" opening. 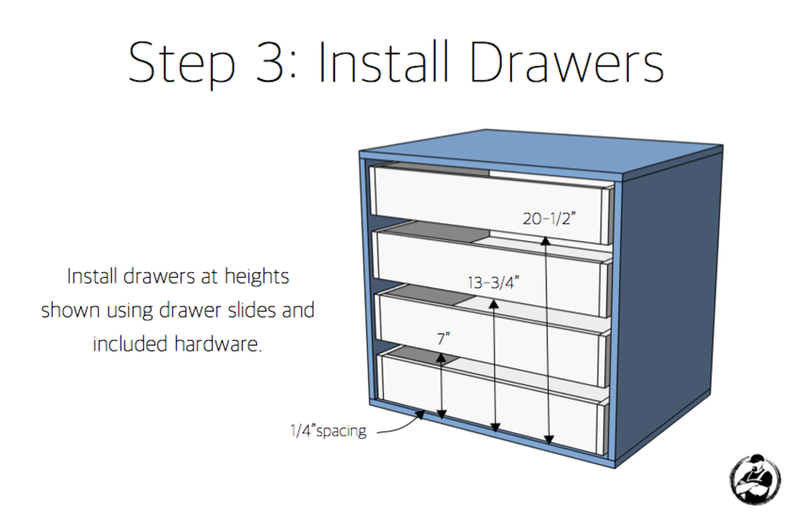 If different slides are used or the opening is not exactly 28-1/2" then the drawer box fronts, backs, and bottoms must be adjusted accordingly. It is optional to paint the box before assembly. If you choose to wait, then you can apply glue to each joint for added strength. We opted to prime and paint prior to assembly and then caulk, fill and apply a final coat after install. 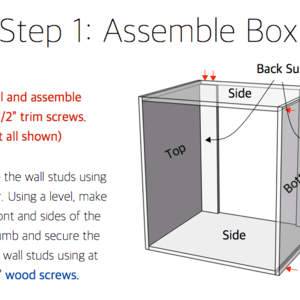 Assemble the box by pre-drilling and screwing together with 1-1/2" trim screws. Trim screws have a smaller head that will minimize the "mushrooming" that happens when screwing into MDF. I also found it easier to temporarily secure the box with 2" brad nails to keep it aligned while drilling and screwing. 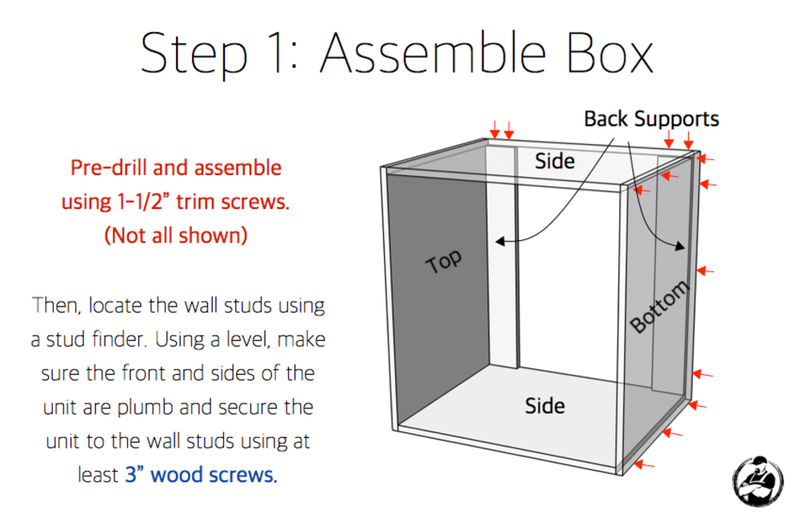 Once the box is assembled locate as desired, assure plumb, level and square and then attach to the wall studs with 3" wood screws. 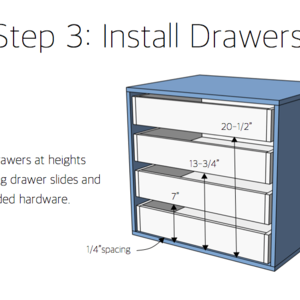 Install the slides and drawers in the box as shown using the hardware included with the slides. 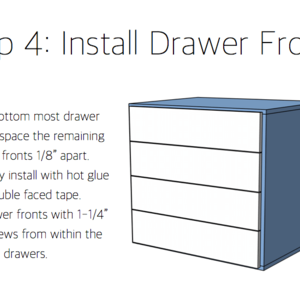 Finally, install the drawer fronts temporarily with hot glue or double faced tape. 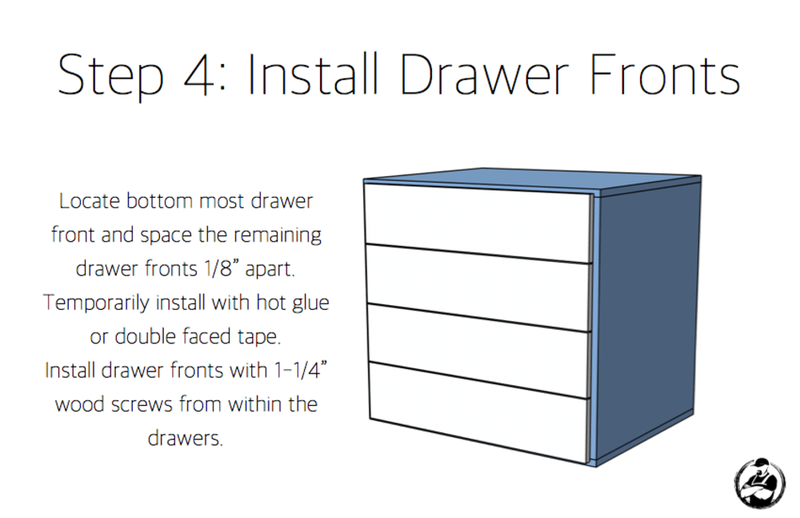 Space the bottom drawer front 1/2"-3/4" from the bottom, then space the remaining drawer fronts 1/8". 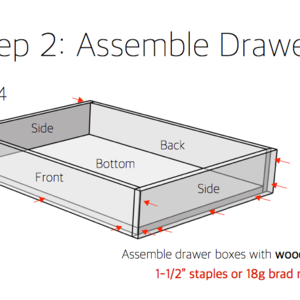 Then secure the fronts from the inside with 1-1/4" wood screws and install desired drawer pulls.